Our new national young people’s campaign is helping schools across Wales to start conversations around mental health in an effort to reduce stigma and discrimination. A new national young people’s campaign is helping schools across Wales to start conversations around mental health in an effort to reduce stigma and discrimination. Time to Change Wales is the first national campaign to end stigma and discrimination faced by people with mental health problems. Since its launch in 2012 the campaign has focused on raising awareness and understanding of mental health among adults – now, with funding from Big Lottery, its new Young People’s Programme is aiming to get younger people talking too. 1 in 10 young people will experience a mental health problem and the stigma and discrimination that goes with it can often make life even harder. 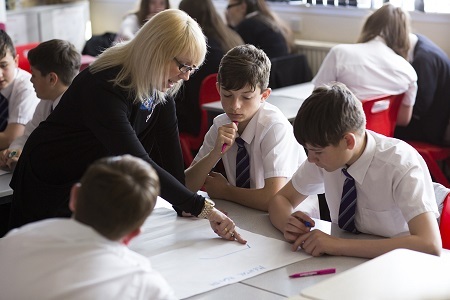 To tackle this, Time to Change Wales will be piloting with nine schools across Wales to introduce a ‘whole-school’ approach, working with pupils, teachers, parents and other school staff to boost awareness of mental health. Three schools in south Wales – Blackwood Comprehensive, Mountain Ash Comprehensive, and Ysgol Gyfun Cymer Rhondda – have already pledged their support, with schools in mid and north Wales to follow. In addition, the campaign will be creating freely available resources to help young people, schools and parents throughout Wales learn and talk about mental health. To celebrate the start of the Young People’s campaign, a special assembly was held at Blackwood Comprehensive on Wednesday 10 May. Head teacher Ravi Pawar and TTCW Programme Manager Lowri Wyn Jones opened the assembly, which was then followed by a series of workshops for year nine pupils led by Time to Change Wales Young Champions – young people with lived experience of mental health problems who help to break down stigma by sharing their stories. Time to Change Wales Champion Laura, from Tredegar, has lived with severe depression with psychotic symptoms as long as she can remember. When she realised at seven or eight years old that hearing voices wasn’t something that everyone experienced, she kept it a secret and her mental health changed and got worse. She said: “I was 15 when I finally told my mum about my mental health. Comparing my life all those years ago to now, I can honestly say that talking saved me. I was afraid to speak up before. Nowadays, I am grateful to have support from my family, boyfriend and friends. Having that encouragement, support and understanding has had a massive impact on how and who I am today." Read more about our work with young people and schools.